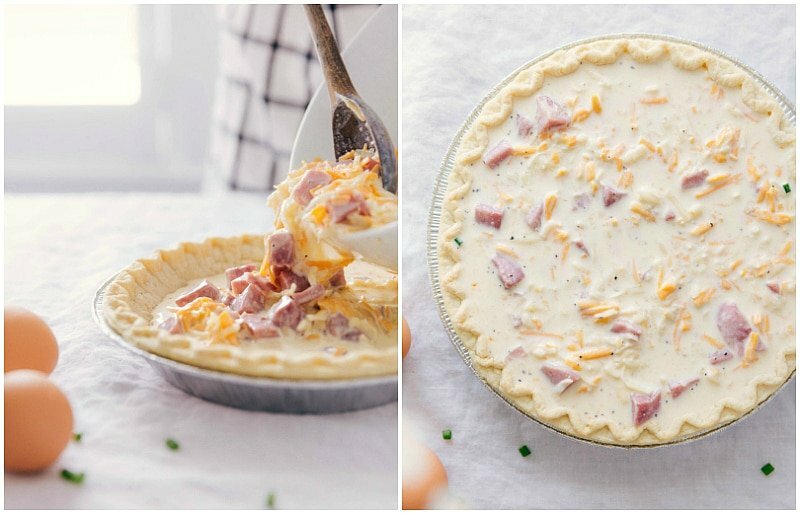 The tastiest and easiest ham and cheese quiche recipe. To keep things as simple as possible, we’re starting with a store-bought pie crust and loading it up with an easy mixture of cubed ham, cheese, and eggs. This quiche recipe is super simple to adapt to your personal preference — use your favorite cheeses, favorite meat, or play around with different seasonings. 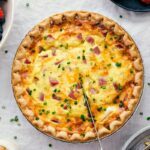 This ham and cheese quiche can be prepared ahead of time, assembled in fifteen minutes or less, and leftovers store well. This is definitely a recipe you want in your arsenal for a last minute meal (breakfast, lunch OR dinner!). It also makes a addition to your breakfast spread. Serve this quiche for brunch alongside a fruit salad or these breakfast chocolate muffins. My sisters and I recently threw a baby shower for our cute cousin who is due in just under a month. We decided it would be fun to do a crepe bar (tutorial for how to make crepes here) with all the toppings, this bread pudding recipe, and some punch. With that much sugar, we definitely needed to throw in some savory! My sister suggested one of her favorites — quiche. In the days leading up to the shower as we were pre-making crepes and working on decorations, I worked on a quiche recipe with a homemade pie crust and perhaps an over-complicated filling. My sisters vetoed that quiche quickly. There simply isn’t always time to make everything from scratch or over-complicate something that can be done very quickly. Especially, as they argued, we’re in a rush to make a lot of things in a short time period. So I simplified things drastically and what resulted is this recipe. A store-bought pie crust, a simple filling, and thumbs up ALL around. My sisters were obsessed with the quiche and it was the first thing gone at the shower! Below I’m share process for making this quiche, some quiche FAQS, and a few tips/tricks. Bake pie crust: preheat the oven and bake the pie crust for 10 minutes. Cook onions: Melt butter in a small nonstick pan and cook onion until soft. Let cool slightly. Whisk together: eggs, half-and-half, and seasonings. 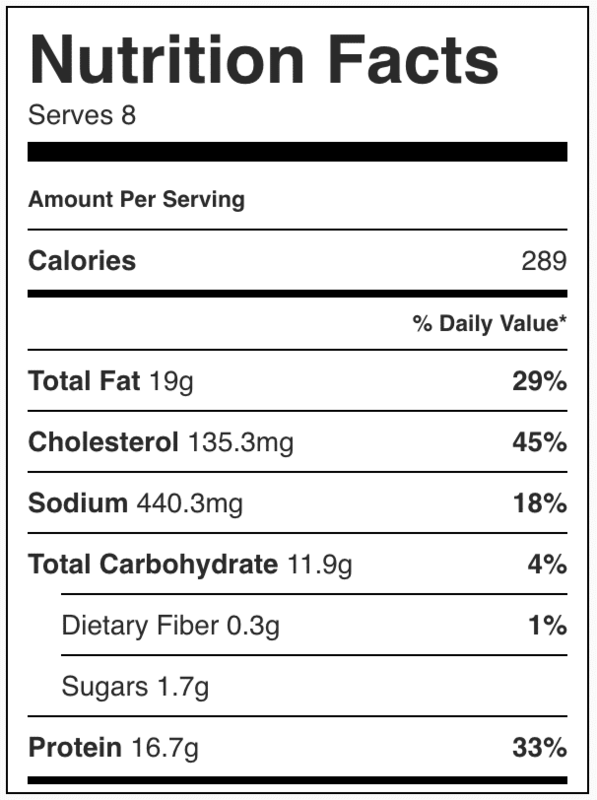 Add ingredients: add in the pre-diced ham (I buy store-bought diced ham OR use leftover holiday ham! ), Swiss cheese, and cheddar cheese. Bake: pour everything into the partially baked pie crust, set the pie on a baking sheet, and bake! 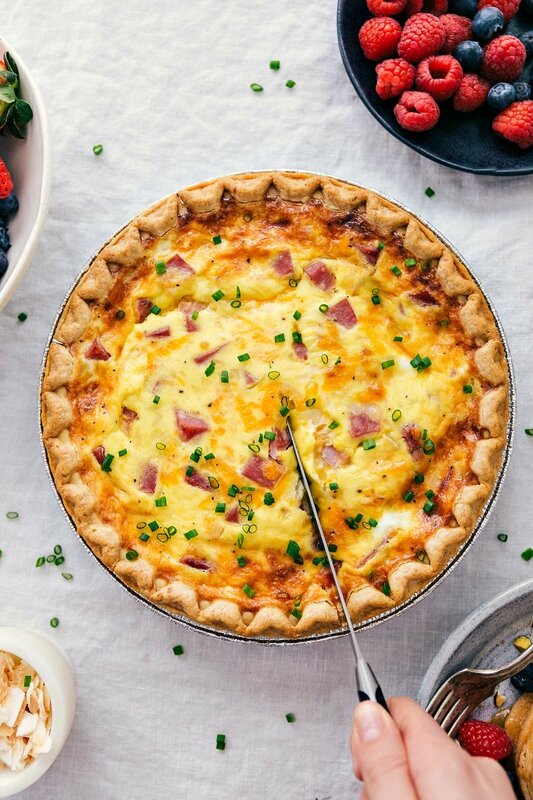 What is the ratio of eggs to milk in a quiche? For this ham and cheese quiche, we use 4 large eggs to 1 cup half-and-half. You can use fat-free half-and-half if you’re looking to reduce calories/fat in this recipe. Can I make a quiche ahead of time? Yes! 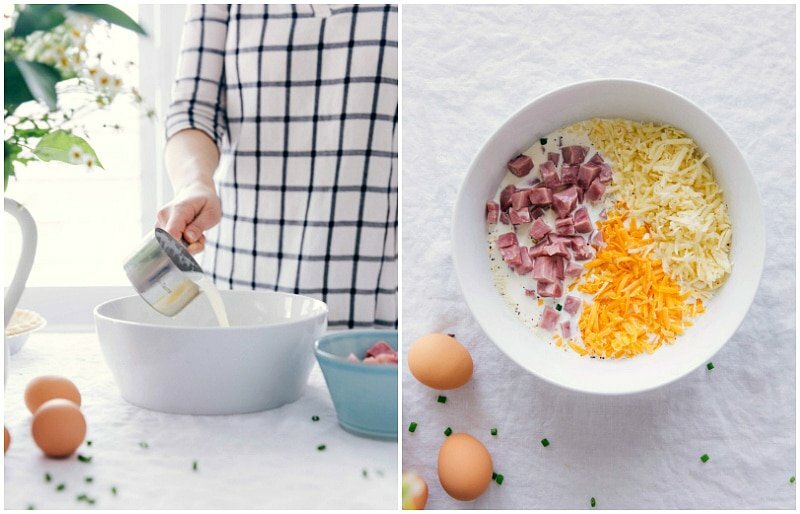 If you’re looking to have it freshly made, simply assemble the filling (onion, eggs, half-and-half, cheeses, ham, and seasonings) in a large bowl. Cover the bowl tightly and refrigerate for up to 24 hours. When ready to make: pour the prepared mixture into the partially baked crust and bake it fresh. If serving this quiche fresh, I wouldn’t bake it ahead of time. Do you have to bake the crust first for a quiche? For this recipe, the answer is yes. Bake the crust for 10 minutes, add the filling, and cook for the additional 35 to 42 minutes. How do you make a quiche without crust? You’ll make a crustless quiche the same way you would make one with a crust. Simply omit the crust and generously spray the pie dish you are cooking the quiche in with a non-stick spray. Cook for 35 -42 minutes. Alternatively here is a recipe for a crustless quiche to use! Watch the quiche as it bakes: if the crust is browning too quickly, cover the outside ring of the crust with a foil (or a pie shield) to keep it from browning further. Don’t skip blind-baking the crust: if you pour the egg mixture into the crust without baking it, that liquid will seep into the crust and prevent it from crisping up. Bake it on the bottom rack of your oven: to ensure every inch of the crust gets golden brown and crisp, you’ll want to bake it on the lower oven rack. Don’t overbake! The best quiche will jiggle a little when you cut into (that tells you the quiche is extra creamy!) Bake until the edges are set, but you still have a little wobble in the center. The tastiest and easiest ham and cheese quiche recipe. To keep things as simple as possible, we're starting with a store-bought pie crust and loading it up with an easy mixture of cubed ham, cheese, and eggs. This quiche recipe is super simple to adapt to your personal preference -- use your favorite cheeses, favorite meat, or play around with different seasonings. Preheat oven to 375 degrees F. Place unwrapped frozen pie crust on a baking sheet and bake for 10 minutes. Remove and allow to slightly cool. Add the butter to a nonstick pan and melt over medium high heat. Add in the diced onion and cook, 3-5 minutes or until soft and translucent. Add in the garlic and stir until fragrant, about 30 seconds. Remove, set aside, and allow to slightly cool. In a large bowl, whisk the eggs until lightly beaten. Then whisk in the half-and-half, Italian seasoning, and salt and pepper (to taste; I use a heaping 1/4 teaspoon of each). Gently stir in the cubed ham and both cheeses. Stir in the cooked onion and garlic mixture. Pour filling into the par-baked pie crust (still on the baking sheet) and bake on your lower oven rack (not the top one) for 35 to 42 minutes, or until set and very slightly jiggly in the center. Serve warm with optional garnishes as desired. This quiche looks perfect, Chelsea! I love how full and loaded with flavor it is. I LOVE quiche. This one looks so perfect and full of flavor! It will be great for Easter morning. 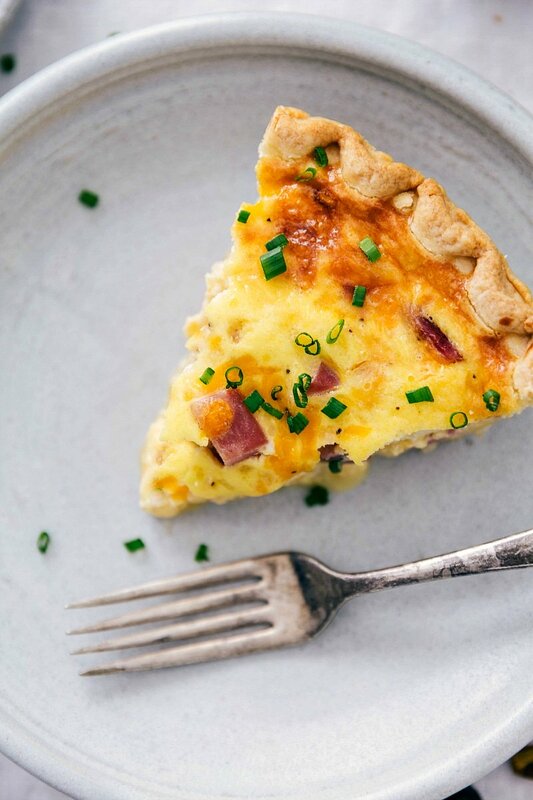 Love how tall and loaded with good stuff this quiche is, its perfect for Easter brunch! Pinned! 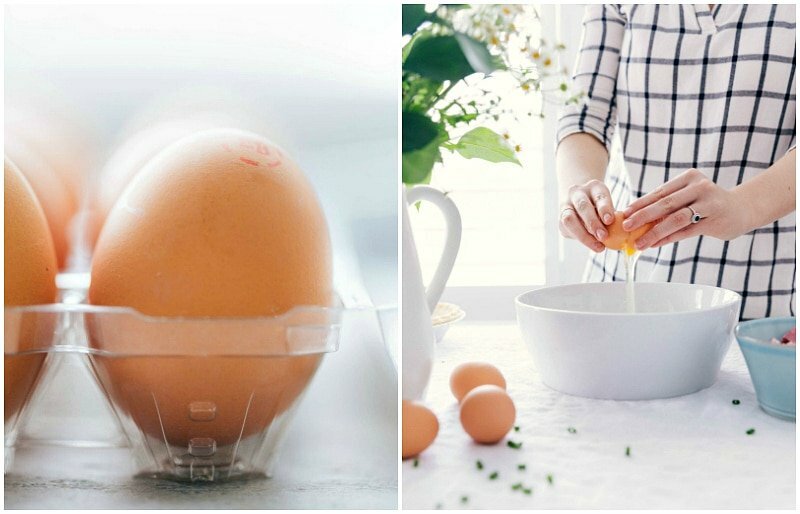 How easy and perfect for Sunday breakfast! I will have to try this with leftover ham! Quiche is one of my breakfast weaknesses! I’m be is SO much trouble with this, so many good things stuffed into that crust! Chelsea this quiche looks so delicious and I am in love with that easy crust! Must make! I love ham. What a wonderful leftover. You can use it so many ways. This is a prime example. I don’t normally talk about ME, but please make note of the slight Name change from Wild Goose Tea. New web design–whoopee and adding some new features. A healthy and delicious dish for breakfast. I would really love to try this. I can taste wondeful flavors just by looking at it.